Friday May 11th 1894 As soon as I got my morning work done I helped Will make garden till time to get dinner. I put out some cabbage in the afternoon and raked under the row of trees west of the garden. Saturday May 12th 1894 I was busy with the work all forenoon. Will plowed the ground for my strawberry bed this morning. We went to town in the afternoon. I spent the time at Fannys. A very pleasant day and evening. It is eight years today since Will and I were married. Sunday May 13th 1894 We went to church this morning and as soon as I could get us some dinner we went to the valley called at Stevens, Andersons & Nelsons. The Whetstones were down at Stevens. It was nearly bed time when we got our evening work done. 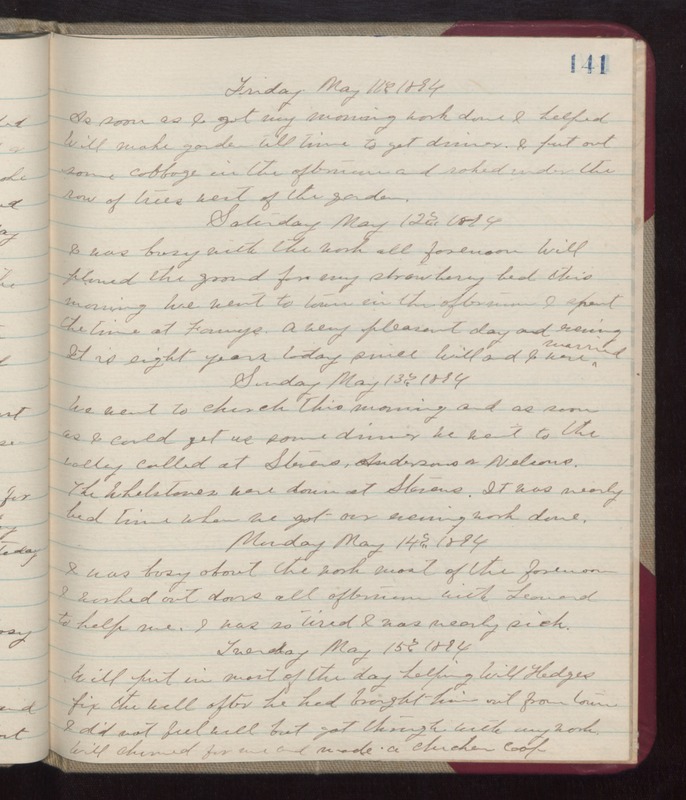 Monday May 14th 1894 I was busy about the work most of the forenoon. I worked out doors all afternoon with Leonard to help me. I was so tired I was nearly sick. Tuesday May 15th 1894 Will put in most of the day helping Will Hedges fix the well after he had brought him out from town. I did not feel well but got through with my work. Will churned for me and made a chicken coop.